Read for This Week’s Study: Eccles. 4:9-12, Phil. 4:11-13, 1 Cor. 7:25-34, Matt. 19:8, Gen. 37:34, Isa. 54:5. Memory Text: “And the LORD God said, ‘It is not good that man should be alone; I will make him a helper comparable to him” (Genesis 2:18, NKJV). Though extreme, this story is an example of a reality: many people are suffering from loneliness. In 2016, The New York Times ran an article entitled, “Researchers Confront an Epidemic of Loneliness”. The problem is real. Study this week’s lesson to prepare for Sabbath, April 27. Read Ecclesiastes 4:9-12. What’s the basic idea there? What principle of life is it talking about in general? Very few of us can make it alone. Even if we are loners and like being alone, sooner or later we not only want some companionship but we might even require it, especially in times of need. We were, indeed, made for community, for fellowship. How fortunate are those who have close family members who can give comfort and support, especially in times of need. Unfortunately, there are people in our church, where we work, in the communities where we live, who have no one to turn to, not just in their time of need, but even for some conversation at the end of the day. The sense of loneliness can come at any time. “The hardest day for me”, an unmarried man said, “is Sunday. During the week I am surrounded by people at work. On Sabbath I see people at church. But on Sunday I am all alone”. What principles can we all learn from the following passages, particularly when we may be going through a time of loneliness? John 16:32, 33; Phil. 4:11-13. Yes, as Christians we have not only the reality of God but the reality of being able to fellowship with God. And we can, indeed, draw comfort from the closeness of God to us. But the closeness of God to Adam, in Eden, didn’t stop the Lord from saying “It is not good that man should be alone” (Gen. 2:18, NKJV). Thus, God knew that Adam, even when he had fellowship with God in a world undamaged by sin, still needed human companionship. How much more, then, do the rest of us need companionship, as well. We need to be careful, too, from assuming that just because there are a lot of people around, a person cannot be lonely. Some of the loneliest people live in big cities where they often have interaction with others. Just being around other bodies doesn’t mean someone cannot feel alone and alienated and in need of fellowship. It’s not always easy to know who is feeling lonely, alienated, rejected, or just plain hurting and in need of someone, if nothing else, just to talk to. How can you proactively seek to be more sensitive to whomever those people might be? What are, according to Paul, good reasons for remaining unmarried? 1 Cor. 7:25-34, NKJV. Of all the ways sin has devastated humanity, with the exception of physical suffering and death, what has faced more devastating consequences from sin than the family? It’s almost as if the phrase, “dysfunctional family” is redundant. What family isn’t, to some degree, dysfunctional? Outside of death, one of the hardest things a family can face is a divorce. People going through this terrible experience run a gamut of emotions. Probably the first and most common is grief, which, depending on the individuals, may last for several months to several years with different intensity. Some may experience fear; fear of the unknown, financial anxieties, and fear of being unable to cope. Some may go through a period of depression, anger, and, yes—loneliness. What broad principles concerning divorce can we gather from the following verses? Mal. 2:16; Matt. 5:31, 32; 19:8; 1 Cor. 7:11-13. “Resources that can be of assistance to members in the development of a strong Christian home are available through the church or other church organizations. These resources include: (1) programs of orientation for couples engaged to be married, (2) programs of instruction for married couples with their families, and (3) programs of support for broken families and divorced individuals”. – The Seventh-day Adventist Church Manual, 19th edition (Nampa, Idaho: Pacific Press Publishing Association, 2016), p. 161. As we know, all relationships, including marriage, sooner or later come to an end in our greatest enemy: death. No matter how close a union, no matter the great love, the deep companionship, the time spent together, as human beings we (unlike chickens) know that sooner or later death will come (unless Jesus returns beforehand) and, when it does, all our relationships will cease. This has been our fate from the first sin and will be so until the return of Jesus. Eve, died first, but it must have been particularly painful for the other one, especially since death was never supposed to be part of life to begin with. If, as we saw in an earlier lesson, the death of a single leaf caused them to mourn, who could imagine what they went through with a death of a spouse? The problem is that we are so used to death, we just take it for granted. But it was never supposed to be something that we as humans experienced. Hence, even to this day, we struggle to make sense of it, when, so often, we just can’t. A young woman named Natalie had been married for seven years when, at the invitation of a friend, she attended an evangelistic series at a local Seventh-day Adventist church. Convicted by what she learned, she surrendered her heart to Christ, had a new-birth experience, and—despite the strenuous objections of her husband, parents, in-laws, even her next-door neighbor—Natalie joined the Seventh-day Adventist Church. She also adjusted her lifestyle, to every degree possible, to her newfound faith. As one could imagine, she faced a great deal of pushback; what made it especially hard was her husband, who argued, and correctly so: “This is not what I signed up for when we got married. You are a whole new person, and I want the old one back”. For years now, she has been struggling to live a life of faith. Though married, she is what we could call “spiritually single”. All over the world, there are “Natalies” in our church. These people, men or women, are married but attend church alone or only with their children. They may have married a person of a different faith. Or perhaps when they joined the church, their spouse did not. Or when married, both were members of the church, but one, for whatever reason, dropped out, stopped coming, and might even be hostile to the faith. These men and woman come alone to church and to the meal after the worship service, or go alone to the outreach or social activities of the church. They are saddened when they cannot contribute financially to the church’s ministry as much as they would like because their spouse does not agree to do so. Though married, they might feel spiritually like a widow or a widower. Further Thought: “In the midst of a life of active labor, Enoch steadfastly maintained his communion with God. The greater and more pressing his labors, the more constant and earnest were his prayers. He continued to exclude himself at certain periods from all society. After remaining for a time among the people, laboring to benefit them by instruction and example, he would withdraw, to spend a season in solitude, hungering and thirsting for that divine knowledge which God alone can impart. Communing thus with God, Enoch came more and more to reflect the divine image. His face was radiant with a holy light, even the light that shineth in the face of Jesus. As he came forth from these divine communings, even the ungodly beheld with awe the impress of heaven upon his countenance”. – Ellen G. White, Gospel Workers, p. 52. Though the story of Enoch here is encouraging and has something powerful to say about those who choose to have times of solitude, many face a solitude they don’t ask for.They don’t want to be alone. Yes, again, we can always have a joyful communion with the Lord, who is everpresent, but sometimes we crave human companionship and fellowship. How crucial that we, as a church, be ready to reach out to those who might be sitting right next to us on Sabbath each week, yet who are going through a terrible season of loneliness. At the same time, if you are going through such a time, seek out someone whom you feel that you can trust at church (or elsewhere) and let them know. Many times people simply cannot tell by looking at someone what they are going through. It’s easy, at least for some people, to hide behind a mask. Samuel Saw, president of the Seventh-day Adventist Church’s Southern Asia-Pacific Division, grew up without a relationship with his father. The two never spent time together in their home country of Myanmar. They didn’t talk about things. “He never hugged me”, Samuel said. “I was a boy without a father”. Samuel, who was raised by his grandparents, went on to study in an Adventist school and graduate as a pastor from the Myanmar Union Adventist Seminary in Myaungmya, a city of 280,000 people located about 140 miles (225 kilometers) west of Myanmar’s capital, Yangon. Church work was challenging in the southeast Asian country where just 4 percent of the population is Christian. Buddhists account for about 90 percent of the population, and Muslims comprise 4 percent. As a pastor, Samuel told many people, “Reach out to your non-Christian family and other relatives”. But he never reached out to his own father. Samuel got married, had two children, and served as a pastor and church administrator in Thailand, Singapore, and the Philippines. While serving as executive secretary of the Southern Asia-Pacific Division, Samuel attended a week of prayer that prompted him to think hard about his father. He shared his childhood story with the speaker, and the two men prayed together. “You’ve got to reach out to your own father”, the speaker said. Samuel prayed to God to give him strength. He felt pain when he thought about his father, and he lacked a desire to connect with him. He kept praying—and the unexpected happened. “I was privileged to baptized my own father at the age of 76”, Samuel said. Samuel still remembers what his father said afterward. “Son”, the elderly man said, “I want to be a Christian who goes to church with a songbook and the Bible in my hand. Please buy a songbook and a Bible for me, so I can carry them to church”. Samuel choked up with emotion as he remembered his father emerging from the water of the baptismal tank and wrapping his arms around him. “It was the first time that he hugged me in my whole life”, he said. 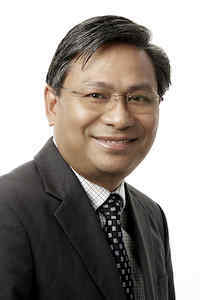 Samuel, elected president of the Southern Asia-Pacific Division, whose territory of 14 countries includes Myanmar, in 2016, encourages others to ask God for help to overcome bitterness and hurt. “We are just human beings without God’s transforming power”, he said. “But with His power, we can be a difference to the world”.